Hi All! Today I made a Mason Jar Pin Cushion! I don't have a ton of sewing supplies but I have enough to need to contain them in one place. I saw this DIY and loved it immediately and the best part is, it turned out better than I expected! 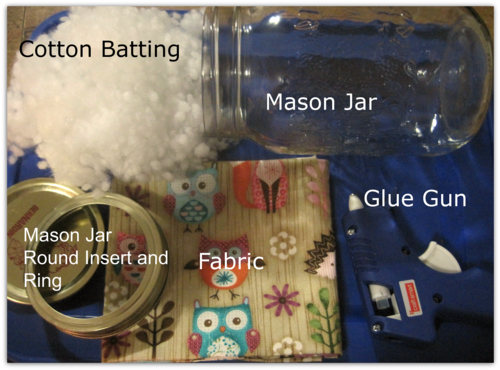 You can use whatever size mason jar you like depending on how many sewing supplies you have. If you do not have a mason jar at home, I found a good selection of used ones at Value Village for like $0.70. As for the fabric, you can use whatever scraps you like. I bought a fat quarter from the fabric store and will use the remainder of the fabric for another project. First, place the circular insert of the mason jar lid on your fabric and measure so that you have at least an inch of extra fabric all the way around then cut into a square. You can eye ball this part and leave more extra fabric if you want to make the pin cushion really puffy. Next, take a handful of batting and place it in the middle of your fabric (which is pattern down) then put the mason jar insert on top. I secured the four corners of the fabric first using my hot glue gun. Once these were set, I added a little more stuffing, then took a little away, then added a little etc. until it was just right. 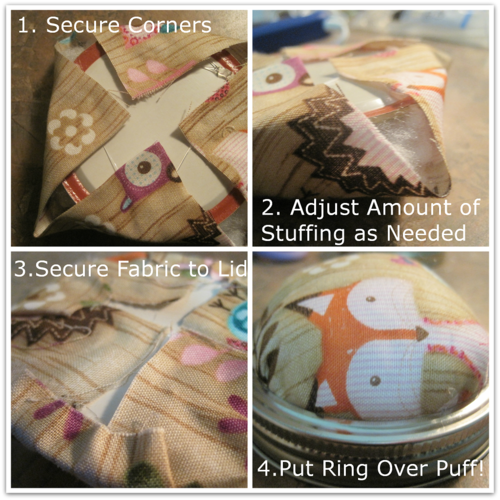 To finish it off, make sure all the fabric is securely glued down to the lid so that you do not loose any stuffing. Finally, place the mason jar ring over top of the puffy fabric part and adjust the stuffing so that the ring fits snugly to the insert. You can glue these two pieces together if you like. 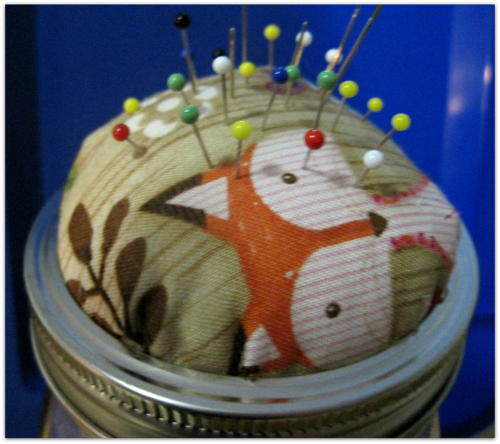 Place the pin cushion lid onto your mason jar and VOILÁ you have a pin cushion sewing container.